On our last day of a quick trip to Las Vegas, we decided that we wanted a good brunch. And by that, I mean that we wanted a feast and lots of bubbly. 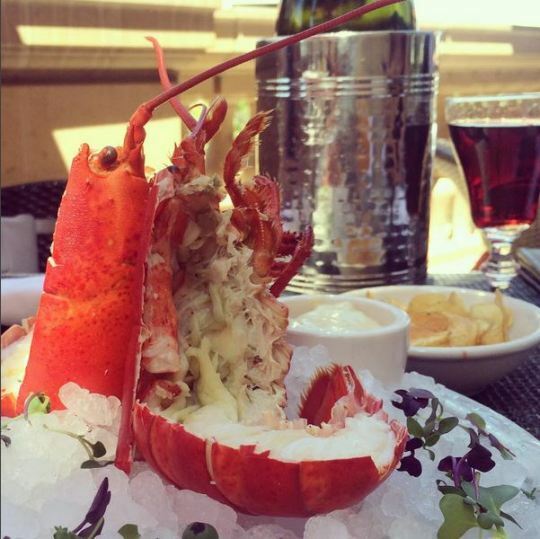 A quick search and we thought LAVO fit the description of what we wanted really well. It also had a patio and we wanted to dine outdoors in the heat, if possible. LAVO is inside the Palazzo Hotel, and is pretty gorgeous (as is the rest of the hotel). It was quite quiet for a Saturday brunch, but we were glad to be seated in at a shaded table on the patio. Upon opening up our menu, we immediately zeroed in on the bottomless brunch special: $30 for unlimited mimosas (plus one to go!). Um, yes please! We put in our mimosa order and they arrived not as prepared mimosas. 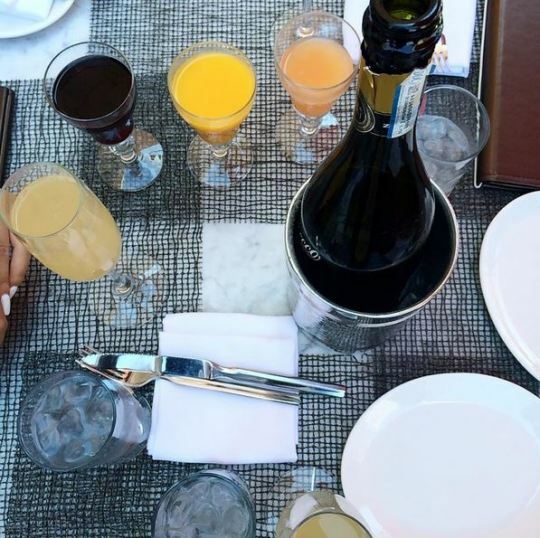 A bottle of champagne was presented on ice, accompanied with 3 glasses for mixing our own mimosas – orange juice, Chamboard, and grapefruit/Solerno liqueur. LOVE. Then came the food. And let me tell you – ALL of it was delicious! We then shared two dishes amongst the three of us. The breakfast pizza was SO good! I am totally copying it for brunch at home. Perfectly chewy pizza dough, perfectly scrambled eggs, smoked salmon… and underneath it all are lightly caramelized onions and creamy goat cheese. It’s perfect. In the back you see the classic CAESAR SALAD with GRILLED STEAK. Now, I pretty much only order Caesar salads if I’m in a salad mood, so I’ve had plenty of them. I have to say that LAVO’s is one of the best. We cleaned the plate, and probably could’ve had more. As we nibbled on our food, we probably went through about 3 or 4 rounds of mimosas. And then the server brought out the 4th type that we forgot about – the LAVO Rose Sangria. He brought 3 glasses, and a pitcher of the sangria. Holy potent! We each had a sip or two and then decided it was in our best interest not to consume any more, if we wanted to walk out of there partially sober. LOL. Now, before I end this post, I have to tell you that our server, DJ, was one of the best and most hospitable we’ve met. And then it made sense why – he was also from Chicago, and had lived with his wife and daughter just a few blocks away from my apartment. He also worked at some of Chicago’s best restaurants, including Chicago Cut. Sometimes a restaurant could have amazing food and have a gorgeous space, but the service makes all the difference in the world. LAVO did well on all accounts. 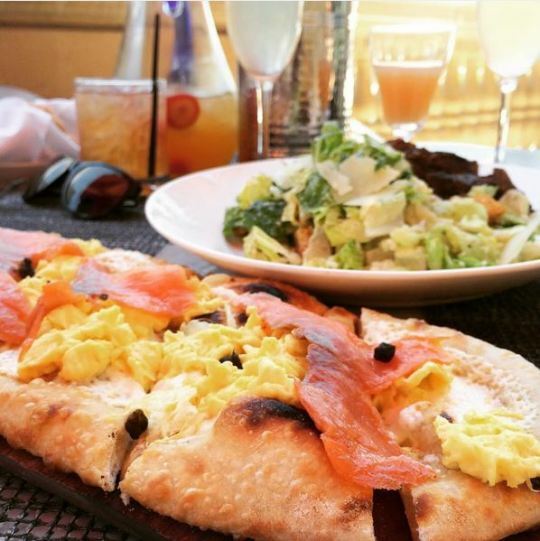 It’s now my go-to patio brunch spot in Vegas, and I can’t wait to go back again.